KAREN & JACK WINSLOW teach one or two workshops together each year. With 2 instructors, the students receive ample support, encouragement. and practical help. Karen & Jack are passing on a tradition, teaching the way they were taught in an atelier (or studio) setting with students of all abilities. They both teach through demonstrations, as well as individual and group critiques, showing and explaining the "hows" and "whys" of artistic principles that make a painting "read" with light, form, and depth. 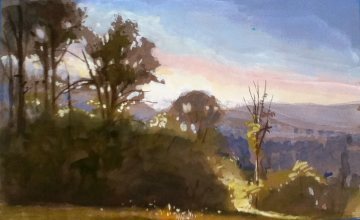 These workshops are generally combination classes with both still life and outdoor landscape painting, and at times they will include head studies, figures and casts. In addition to teaching together, Karen teaches a weekly still life class and a weekly landscape classs. All levels are welcome, and Winslow Art Studio is wheelchair accessible. Easels and taborets for indoor classes are provided. Artists supply all other art materials. If you would like more information, please email or phone. Below are photos from some of the 5 Day workshops and still life classes. Karen also teaches workshops for Southern Vermont Art Center (www.svac.org) and Lyme Art Association (www.lymeartassociation.org). "Quite honestly, I consider her the best teacher I have had the opportunity to be the student of." "I was so nervous about doing my first portrait from life, and you let me observe you painting with me bombarding you with questions. I love the small one I did! Your guidance, attention, and wisdom showed me what a master teacher you are. Can't wait for next year!" SUNDAY PAINTERS - Every Sunday - 11am-4pm. Suitable for beginners and intermediate students, as well as advanced students, focusing on values, form and learning to mass. It is a great introduction to using a controlled palette (with value scales). Karen Winslow paints along side of the students, domonstrates and offers help and instruction. During the summer and fall, we will be painting outdoor landscapes at various locations. On rainy Sundays, we will be in the studio painting still life or floral, where the student can choose from several different still life arrangements. On the LAST SUNDAY OF EACH MONTH, we will study portrait painting using the skull, casts, and planes head, along with mixing flesh tones and practice exercises from 11am-1pm, focusing on comparative measurement, constructive landmarks and rhythm. This will be prior to the model posing. The model will pose from 1-4pm, where you will apply what you learned to the model. OPEN FIGURE/PORTRAIT - LONG POSE SESSIONS FOR DRAWING OR PAINTING - NO INSTRUCTION - Artists wishing to draw or paint from the figure/portrait model are welcome. LAST SUNDAY OF EACH MONTH - split model fee. Long pose (3 hour repeated pose). Bring your own art supplies. Call for information. 3 DAY - ELEMENTS OF LANDSCAPE AND STILL LIFE PAINTING - Center for the Arts of Bonita Springs -artcenterbonita.org/workshop.htm Bonita Spings, FL - March 17-19, 2014- This is a combination class focusing on creating realistic still life and plein air paintings from life. 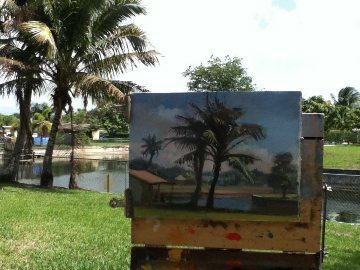 The landscape sessions will be at various locations in Bonita Springs, with one day at the Naples Botanical Gardens. I teach through demonstrations and one-on-one critiques. Mediums: oils, watercolors, or pastels. All levels. Cost: $275 Members / $325 Non-members See description below for more information. 1. Organizing your palette and premixing color/value scales. 3. Following rhythms to create movement. 4. Simplifying design into 5 basic planes of light. 5. Striving to maintain the unity of the "whole" by controlling details. 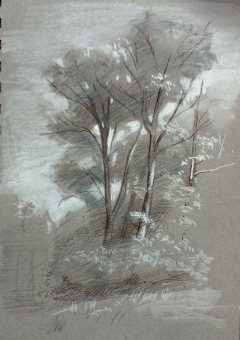 Students have the option to take this workshop as a STILL LIFE ONLY (afternoons) or PLEIN AIR ONLY (mornings) for $250. Or, they can take the combination STILL LIFE AND PLEIN AIR for $350. All students must take the first day, where I will be covering a lot of material, demonstrating, and teaching how to mix the landscape palette (known as the prismatic palette).